Yosemite Lodge (temporarily known as "Yosemite Valley Lodge" due to a trademark dispute) is the Yosemite Valley hotel option for visitors who don't want to shell out $500+ per night for the exclusive Ahwahnee Hotel, with rooms starting at around $270 per night. Whereabouts: The lodge certainly has the location to justify charging the rates it does: it's across the road from the Lower Yosemite Falls trailhead, and the falls are visible from the hotel grounds. In addition, Yosemite Village, a useful collection of shops and restaurants, is a short walk to the east, and Leidig Meadow, the filming location for the Indian village in Maverick, is an equal distance to the west. The Glacier Point shuttle bus, which you're likely to use if you're doing either the 4-Mile or Panorama trails, leaves from the lot outside the front desk (pictured above). Dining/Shopping: A handful of restaurants and shops surround the lodge's central courtyard. The Food Court includes a cafeteria and the Coffee Corner, which serves pastries and caffeine. The Mountain Room contains a full-service restaurant and an adjacent lounge. 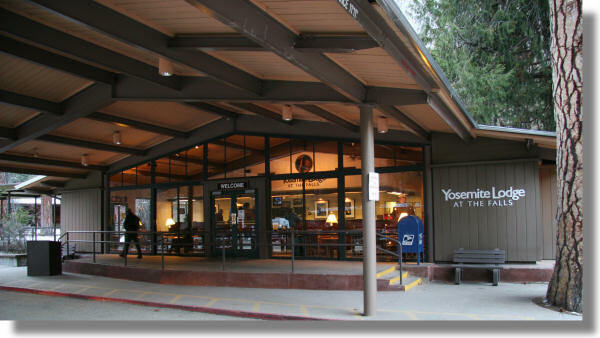 The Yosemite Lodge Gift Shop offers a satisfactory supply of candy bars, sodas, and refrigerator magnets; if you require pricier souvenirs, visit The Nature Shop, which sells original art and photographic prints, or walk east to the Ansel Adams Gallery in Yosemite Village. Swimming: There's a swimming pool tucked away in the back. It's free for guests, and non-guests can swim there for $5 apiece ($4 for children), although it's unlikely that many do when they can swim for free in the Merced River at Sentinel Beach or Mirror Lake. On the other hand, no place on the Merced offers waterside bar service, as the pool does on summer weekends. Getting In: The Yosemite Lodge typically sells out months in advance for summer dates. It's less crowded in the winter, and you can sometimes walk up to the front desk and get a room. I've tried getting off-season rooms a couple months ahead and found everything already taken, though, so I'd recommend getting reservations ahead of time whatever time of year you're going; you can check for availability here.